Situated in the Sonoran Desert, The JW Marriott Starr Pass Resort and Spa is surrounded by clear skies, mountain peaks and desert beauty. Our Old Pueblo Style and Native American accents offer your senses a remarkable glimpse into the history that is uniquely part of our culture. 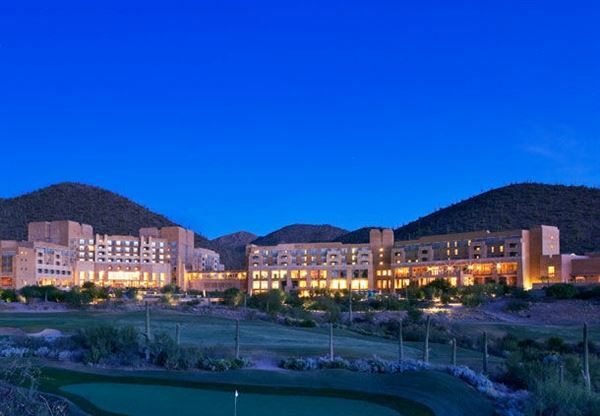 Under the starry skies of Tucson lies the JW Marriott Starr Pass Resort and Spa. This amazing resort is the perfect canvas allowing you the freedom to create a picture perfect experience for you and your guests. Our colorful and dramatic settings, panoramic views of the mountains and city lights, will set the stage for your vision to come to life. Celebrate your reception indoors or outside under the sun or the stars. We are delighted to provide you with the following complimentary enhancements for your reception and dinner package. • Butler passed hors d'oeuvres for the Cocktail Reception • One-Hour Hosted Bar for the Cocktail Reception • 3-Course Plated Dinner - First Course: Choice of Soup, Salad, or Petite Soup and Salad Pairing - Second Course: Choice of Dinner Entrée Selections - Third Course: The Wedding Cake • The Unforgettable Wedding Cake is custom-created and designed with our award-winning Pastry Chef • Sparkling Champagne or Cider Wedding Toast • A hosted taste panel for the Couple • Complimentary suite for the Couple during the wedding celebration • Rose petal turndown service for the Couple on the wedding night • Chocolate covered strawberries and champagne "Sweet Dreams" package for the Couple on the wedding night. See attachment for details.